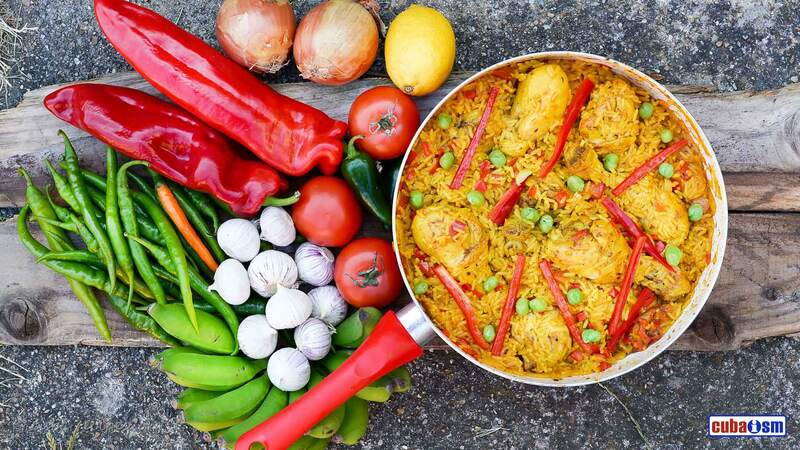 The Arroz con Pollo a la Chorrera (Yellow Rice and Chicken soupy style) is a very popular and one of the most delicious recipes in traditional Cuban cuisine, and is very simple to prepare. See below and get to know how to prepare and serve, enjoy it. 1 large chicken, about 4 pounds, cut into 8 pieces. Wash the chicken and blot dry with paper towels. Mix the oregano, cumin, white pepper and vinegar in a large glass bowl. Add the chicken, turning the pieces to cover with the mixture. Let marinate at least 15 minutes. Heat the oil in a large heatproof casserole (**) Brown the chicken pieces all over, about 2 minutes per side. Transfer the chicken to a platter and pour out all but 2 tablespoons of the fat. For sofrito: Add the onion, bell pepper and garlic to the oil in the casserole, cook over medium heat heat until soft but do not brown, about 1 or 2 minutes. Add the tomato and cook for one more minute. Return the chicken to the casserole with the sofrito and cook for about 1 or 2 more minutes. Add the water, wine and beer(*), saffron (if you use it instead of annatto oil), tomato paste and salt and pepper. Bring to a boil, reduce heat, cover and simmer for about 30 minutes. While the chicken is cooking, place annato seeds in small saucepan with 1/4 cup of the chicken cooking liquid. Simmer for about 5 minutes. Strain mixture back into the chicken. Thoroughly wash rice swishing with your hands, and drain off the water. Continue doing this until water runs clear. Bring chicken mixture to a boil, stir in the washed rice, reduce heat, cover and simmer until the rice is tender, about 20 to 25 minutes. If it starts to dry out and rice is still al dente, add more liquid. If it gets too soupy, uncover during the last 10 or 15 minutes of cooking. Just before it is done, stir in half of the petit pois and pimientos. Garnish with the rest. Note: sometimes you can find yellow rice already packaged. This recipe serves 6 to 8 people.